← Waiting for the Doctor…. I’ve told this story many times, how I grew up in a Polish community in the U.S., but was not interested in my heritage, until I saw a performance by the Mazowsze Polish Folk Song and Dance Ensemble, better known as the Państwowy Zespół Ludowy Pieśni i Tańca Mazowsze im. Tadeusza Sygietyńskiego w Karolinie. Sure, the boys were very handsome (and the girls beautiful), and I was embarking on a career as a dancer, so the obvious attractions were there. However, it was something more. Maybe it was the memory of a song on the radio… or a Mazur from a Chopin concert… Maybe it was the Polish blood flowing through my veins…. Maybe it was all of these things that caused my heart to beat to the rhythms of the music of Tadeusz Sygietyński. Whatever it was, it was magic ! I was hooked !! 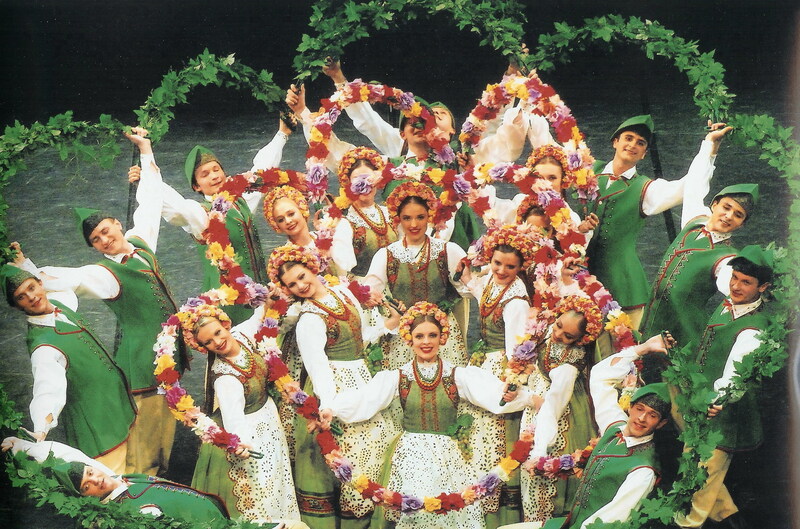 The „Mazowsze” Song and Dance Ensemble is an artistic phenomenon on a world scale. It presents the charm of Polish folklore, beautiful songs, and folk costumes representing the distinctive styles of 43 ethnographic regions of Poland. Founded in 1948 by Composer, Tadeusz Sygietyński (1896-1955), and his wife, Actress-Singer, Mira Ziminska-Sygietyńska (1901-1997), „Mazowsze” began performing in 1950, and made a great contribution towards preserving Polish culture during the time when communism ruled in Poland. Professor Sygietyński’s songs are based on old folk songs, though many are his own compositions, which have already passed into the national folklore, so closely did he follow the native idioms of Polish music. Mme. Ziminska, dubbed Poland’s „Woman of the Century”, was the Artistic Director whose settings and costumes have played a prominent part in the company’s success. 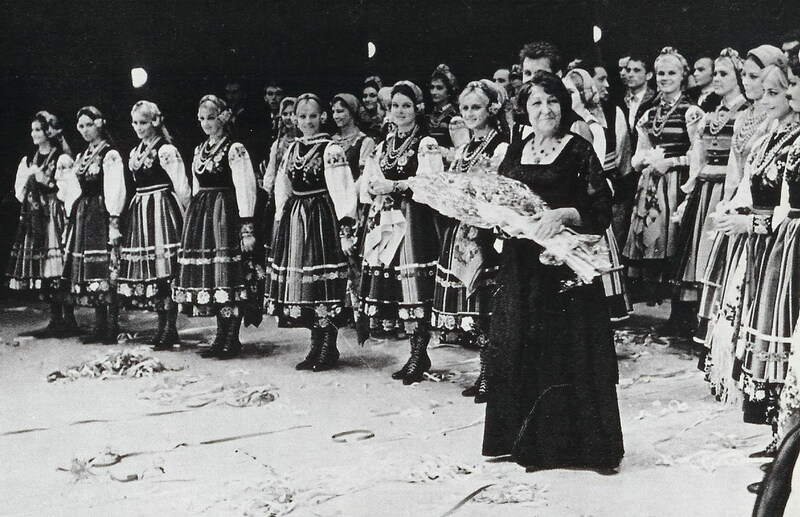 Under her direction, Mazowsze became famous all over the world. The spectacles of Mazowsze have inspired Polish people living outside Poland, while audiences in other countries were exposed to the magnificence which is Polish culture. 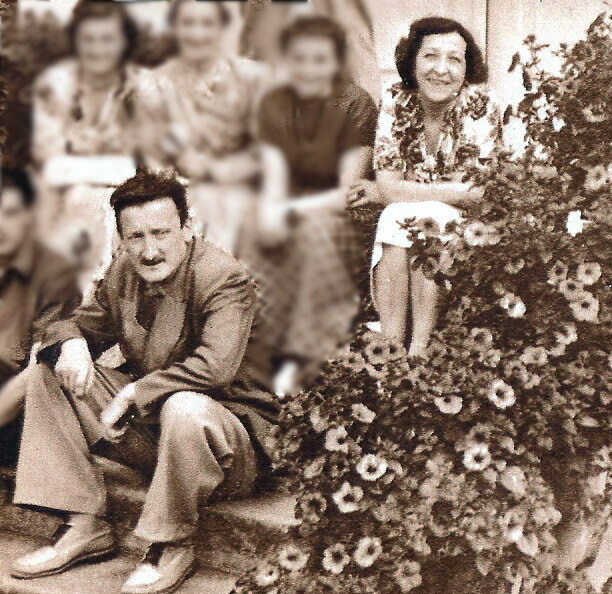 But the Sygietyńskis did not do it alone. There were other Mazowsze legends who have made Mazowsze Poland’s premier cultural ambassadors. Among them is a man whom I am honored to call a friend. Mazowsze’s Head Choreographer, Witold Zapała. 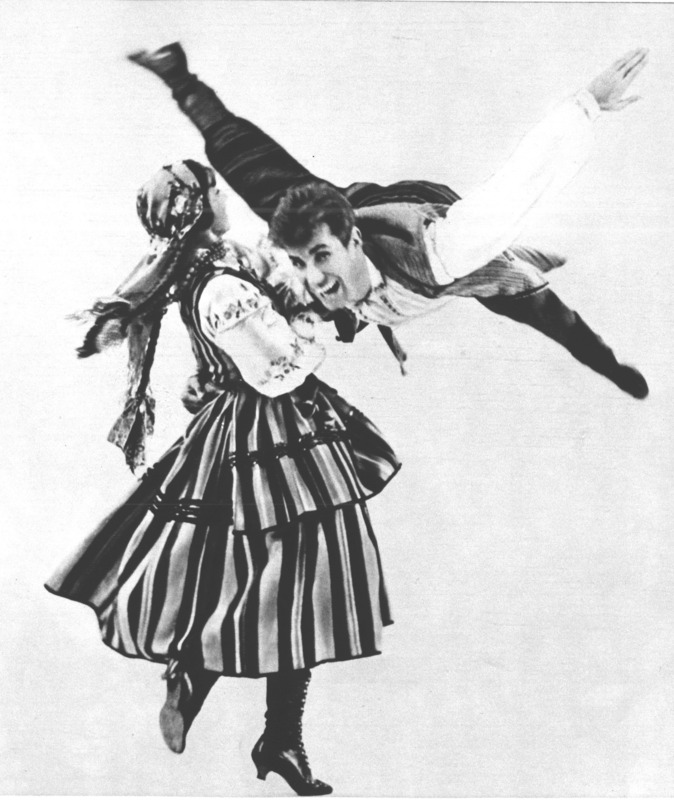 Nicknamed “Szef” (chief, boss, el-supremo), Choreographer, Witold Zapała, joined „Mazowsze” in 1957 as a Dancer. He is the best I have ever seen. It is as if he could fly through the air. Even at 75, Zapała continues to insure the integrity of Mazowsze’s artistic style. 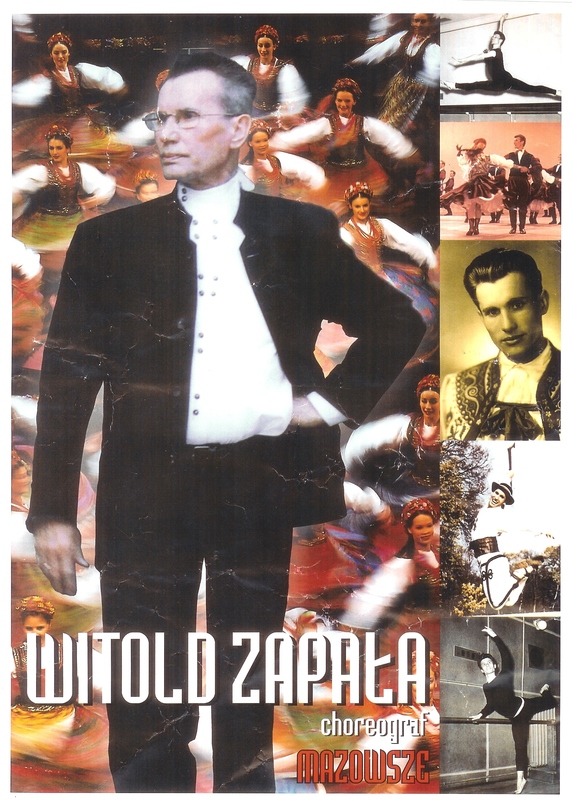 I met Witold Zapała at a Polish Folk Dance festival in Los Angeles. 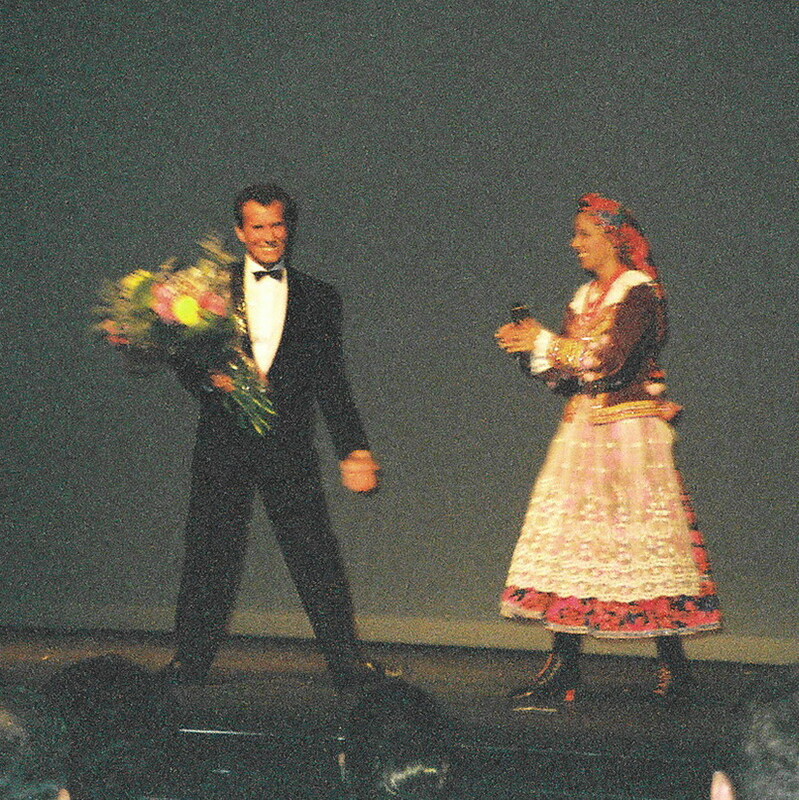 He was one of the choreographers who came from Poland to coach the dancers from the 15 Polish dance troupes in attendance. It was amazing to watch how he created the beautiful formations that just dazzled the audience. But what was even more amazing was the development of our friendship, and, along with it, the opportunity to see him work with Mazowsze in Poland ! 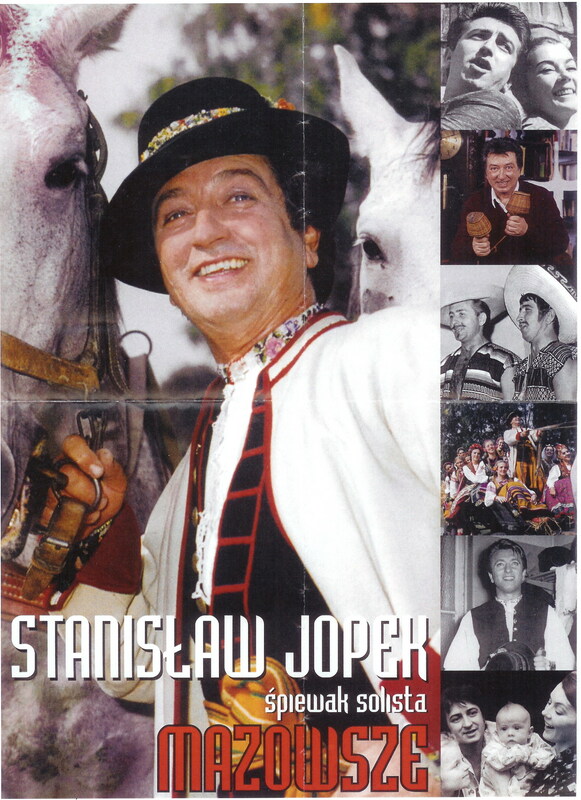 Another of Mazowsze’s legends is Tenor/Baritone, Stanisław Jopek (1935-2006), who joined „Mazowsze” in 1956, and performed in every concert right up until his death in 2006. 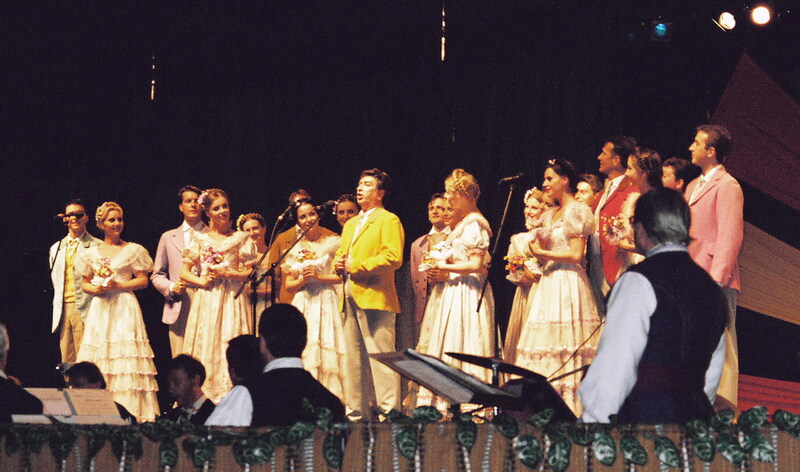 Jopek is known as „The First Furman (Coachman) of Poland” for his signature song. I have many memories of Stanisław Jopek. My favorite one is from 1998, my first trip to Poland since 1974. Having just arrived in Warsaw, I heard singing outside my hotel window. It sounded very much like Mazowsze to me, so I quickly ran downstairs, and there he was, walking through the lobby with the other singers. They had been rehearsing at the hotel. It was a magical ‘Welcome to Poland’ for me. 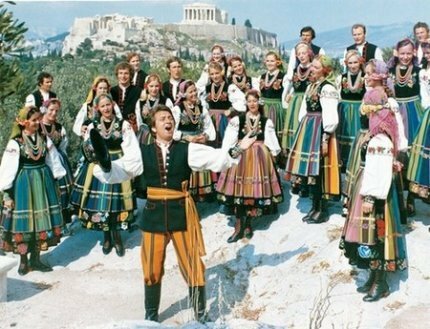 Besides his role as Poland’s #1 folk singer, Stanisław Jopek is known for his Christmas Kolędy, his rendition of Chopin, and Moniuszko arias, and for singing songs from all over the world. He sang in 36 languages, including Chinese, Finnish, and Arabic. 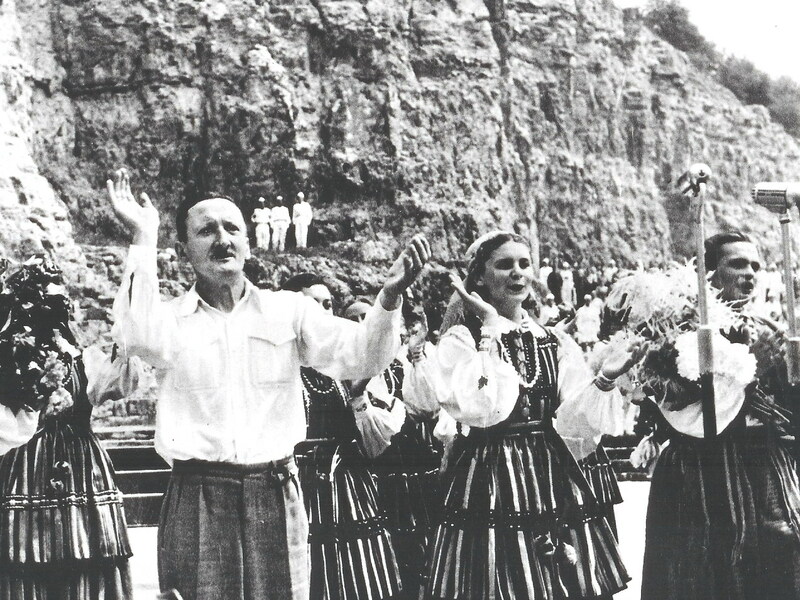 While on tour, „Mazowsze” always sings one or two folk songs from the country they are visiting. Poland certainly mourned the passing of Stanisław Jopek. His songs were the soundtrack of our lives. The very first song I ever heard him sing in 1973 was the Walczyk o Zamku. Mazowsze performed that song in order to raise money to rebuild the Royal Castle in Warsaw, which had been destroyed during World War II. It was also the last song I heard him sing in 2002… an updated version which celebrated the restoration of the Castle. 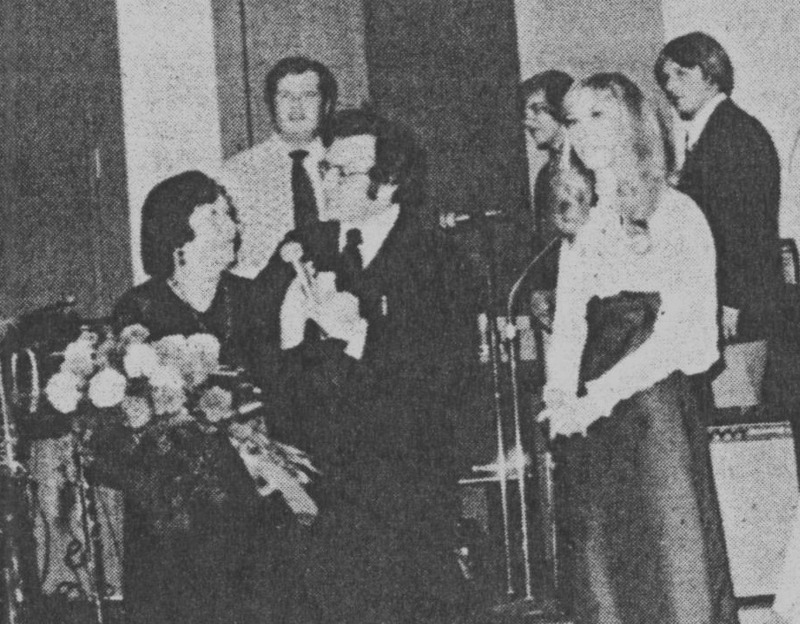 Since a portion of the audience was comprised of Polish Folk Troupes from all over the world…dancers and singers whose Idols were „the Mazowsze”, it was no surprise that it was like being at a rock concert or sporting event… The audience cheered wildly, from the moment the orchestra walked out. It was easy to feel the love poured out for Mazowsze. Another of Mazowsze’s legends was there as well, performing in the orchestra, as he had since 1948. 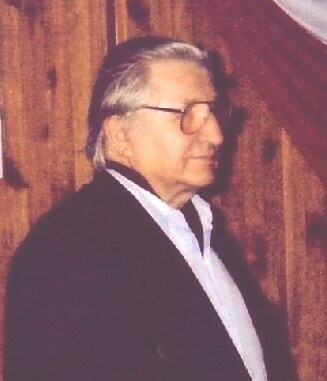 Mieczysław Piwkowski took over most of the musical arrangements after the passing of Tadeusz Sygietyński, and is perhaps the one person who was with Mazowsze the longest, finally retiring in 2005. For a long time I didn’t know exactly who he was, but he was obviously extremely talented… he played just about every musical instrument. He was also very friendly, and I am thrilled that he always took the time to speak with me. 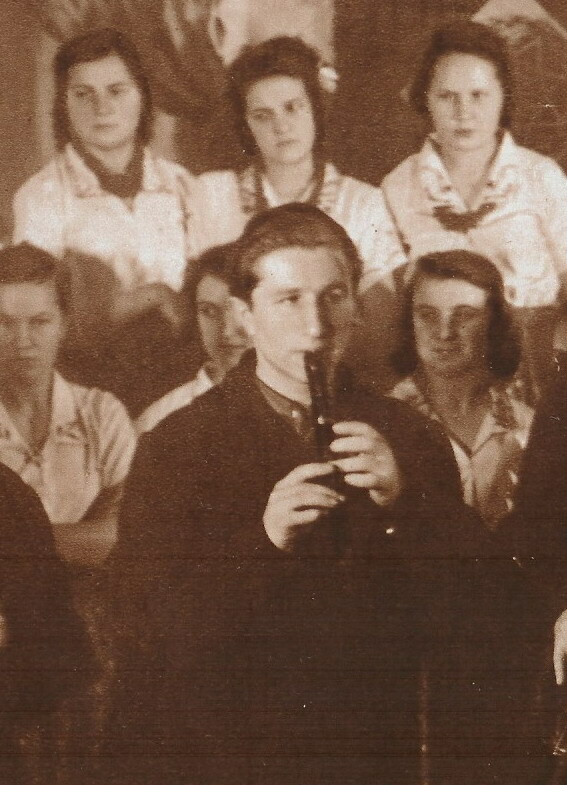 I knew that he was a great musician, but what I did not know is that in the early days of Mazowsze, “Piwek” was also a dancer !! We are all thankful to these “Legends” for keeping our culture alive with their magnificent songs and colorful dances. Because of them Mazowsze, and Poland will live on in our hearts. The Moral of the Story is that when you look for inspiration, look to your own heritage. It will always be a part of you and will influence the way you live. If you embrace it, it will bring you much joy and happiness. Gallery | This entry was posted in Mazowsze, Poland, Polish Music and tagged Arabic, baritone, Chinese, Chopin, choreographer, Communism, culture, Finnish, folk festival, Furman, Góralski, heritage, Japanese, Karolin, legend, Los Angeles, Lubuskie, Magnificent, Mazowsze, Mazur, Mieczysław Piwkowski, Mira Ziminska-Sygietyńska, Oberek Opoczyński, Państwowy Zespół Ludowy, Podhalański, Polish folk dance, Polish folk music, Royal Castle, Russian, Rzeszów, soloist, soundtrack, Stanisław Jopek, Szef, Tadeusz Sygietyński, tenor, Warsaw, Winobranie, Witold Zapała, Woman of the Century, World War II, Zamek Królewski. Bookmark the permalink. Great post, mate. Just discovered your blog. Please keep up the good work! Normally I don’t learn post on blogs, but I wish to say that this write-up compelled me to check out. Your writing style is amazing. Thanks, very great article. Hi there! I know this is kinda off topic however I’d figured I’d ask. Would you be interested in exchanging links or maybe guest authoring a blog site article or vice-versa? My site covers a lot of the same subjects as yours and I feel we could greatly benefit from each other. If you happen to be interested feel free to shoot me an e-mail. I anticipate hearing from you! ……….. Excellent blog site by the way! Thanks so much for providing individuals with a very marvellous chance to discover important secrets from this site. Thanks For sharing info about Mazowsze Legends. We just couldnt leave your website before telling you that we really enjoyed the quality information you offer to your visitors… Will be back soon to check up on new stuff you post! Thanks For sharing Mazowsze Legends. Excellent goods from you, man. Mazowsze Legends is just too fantastic. I really like what you’ve posted here, really like what you’re saying and the way in which you say it. You make it entertaining and you still care for to keep it smart. I cant wait to read much more from you. This is really a terrific Mazowsze Legends | Do Gory information. Greetings! I’ve been following your weblog for a long time now and finally got the courage to go ahead and give you a shout out from Kingwood Texas!